The Penn Grade 1 Partial Synthetic SAE 5W-30 is ideally suited in today's street/racing market crate engines that require this viscosity. It contains strong detergent, dispersant and ZDDP anti-wear additives to help protect critical engine parts. 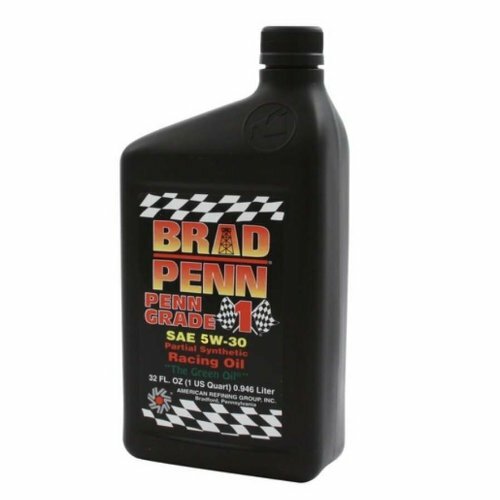 Brad Penn Grade 1 motor oil is desirable for their anti-wear additives, making them highly suitable for flat tappet camshaft engines. These high-quality race lubricants are 100 percent made in the USA for racers, engine builders, and enthusiasts. Brad Penn Grade 1 motor oils have a unique base oil that causes them to cling to your engine's parts, minimizing wear during high-torque, high-stress competition. They contain highly effective detergent and dispersant additives to keep your engine clean and running at the peak of performance. These motor oils are available in synthetic blends and straight grades. They are designed for the higher lubrication of competition engines with superior alcohol separation to ensure continual lubricating of the engine. If you have any questions about this product by Brad Penn, contact us by completing and submitting the form below. If you are looking for a specif part number, please include it with your message.